If you reside outside of the tri-state area or are unable to attend the NYC intensives in person, BTHM is offering an online version of the coursework. Providing the flexibility of an online education. Complete coursework through electronic forums. Receive lectures, questions and assignments from Katelan and Sherene electronically. Study them at your convenience. Login at least two days per week for BTHM classes. You choose the days and times. Access online articles from BTHM guest speakers. Collaborate on additional assignments with other students of BTHM. For a complete listing of the certification coursework please see modules (Fire, Air, Water, Earth). Beneath the Half Moon is a year-long intensive immersion in the ancient Priestess arts. Katelan and Sherene have extensive knowledge and wisdom from their combined backgrounds in metaphysics, art, psychology, and mediumship in private work with their clients in New York City. This is the first year-long multidisciplinary program of it’s kind. Art forms include Astrology, Tarot, Bellydance, Healing, Ritual, Cleansing, Body-Mind Connection, Authentic Movement which can be applied to enrich your life goals. Whether you’re an artist, writer, dancer, therapist, teacher, business woman, mom, life coach or still searching for your own career path, Beneath the Half Moon will ground you in a deep experience of these ancient tools of self-knowledge and empowerment. The courses are carefully crafted to unlock powerful levels of creativity, intuition, sexuality, confidence, self-possession, and fearlessness. Sherene Schostak is a Jungian psychotherapist, author and metaphysician who specializes in helping creative artists transform their addictions and blocks. She has been in private practice in New York City for the past fourteen years consulting, writing and teaching. Sherene is the editor and one of the creators (with Katelan) of Constellation magazine; and the Zodiac Dance DVD and the authentic movement workshops from which it was derived. She is the co-author of Surviving Saturn’s Return: Overcoming the most tumultuous time of your life (McGraw Hill) as well as The Fate of Your Date (Chronicle Books). She holds a Master’s Degree from New York University in Clinical Psychology, a Master’s in Educational Psychology from Pace University in New York, and advanced graduate work in Psychoanlalytic Psychology from The New School. She is currently the resident astrologer at Elle UK magazine/ElleUk.com and formerly wrote the astrology column for Teen Vogue. Other writing credits/features include: A regular blog on Jungian Astrology for Astrology.com; The Benjamin Moore Aurascope Campaign; Star Signs for NBC/iVillage; Lifescript; and reviews in The Mountain Astrologer. Sherene teaches classes and workshops internationally on Astrology, Archetypal Psychology, Eastern Philosophy and Authentic Movement. Yearly pilgrimages to India over the past decade have influenced an Eastern philosophy and approach to her work. Sherene humbly attributes much of her metaphysical knowledge to her spiritual guru Mata Amritanandamayi, and the insight of her late astrology mentor, Edwin Steinbrecher. She received her astrology certification in 2000 and continues to incorporate D.O.M.E.’s Inner Guide Meditation technique — a powerful process of integrating Jungian Active Imagination with Astrology. Katelan Foisy is a visual artist, spiritual reader, healer, and model based out of NYC. She studied illustration at Pratt Institute in Brooklyn NY and started her career in the communication arts shortly after graduating in 2001. Her mixed media collages often evoke a gamut of emotion through the rich layers and textural combinations. She is known to use herself as well as her friends in her pieces manipulating faces and bodies to create new characters. This process eventually lead her to create “They Be We” a self portrait project. Her fine art pieces have been displayed at The Worcester Art Museum, Ohio History Museum, Museum of Contemporary Art DC, Museum of Design Atlanta (MODA), Mae West Fest, as well as the A&D gallery in London. Her illustration clients have included, The Grammy Awards, Out magazine, Scholastic, and The Progressive. She is also the art director and one of the creators (with Sherene) of Constellation Magazine and co-owner of Knickerbocker Circus, an independent publishing company. A natural empath and medium, Katelan created her own form of energy healing based on Native American techniques and applied them into her everyday practices as an artist, healer, and reader. 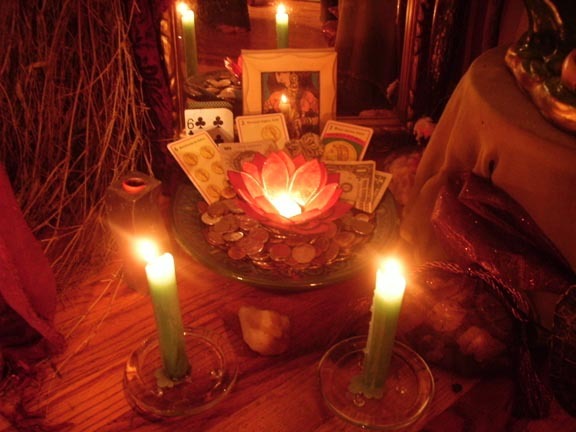 She has been trained in traditional reiki and practiced both techniques as well as tarot at one of the largest Botanica’s in America before starting her own practice 5 years ago. She holds public cleansing circles in her home whenever possible. Katelan comes from a long line of herbalists, mystics, and healers. She is currently studying Afro-Cuban traditions under her Godfather Ochani Lele and is a confirmed child of Eleggua.